M S P CO NO 1 (1931) The 20 ton 36 foot scow M S P Co No 1 foundered in Alaska in about 1931. MAFCO 8 (1951) The 7 ton 28 foot wooden gas screw fishing vessel Mafco 8 foundered June 14, 1951 in the Gulf of Alaska at 50 56 N 139 55 W.
MAFCO 9 (1951) The 7 ton 28 foot wooden gas screw fishing vessel Mafco 9 foundered June 14, 1951 in the Gulf of Alaska at 50 56 N 139 55 W.
MAGI (1987) The 30 foot fishing vessel Magi sank July 2, 1987 at Naked Island. MARTHA A (1949) The 128 ton 107 foot wooden oil screw fishing vessel Martha A stranded and was lost near Mary Island on April 26, 1949. 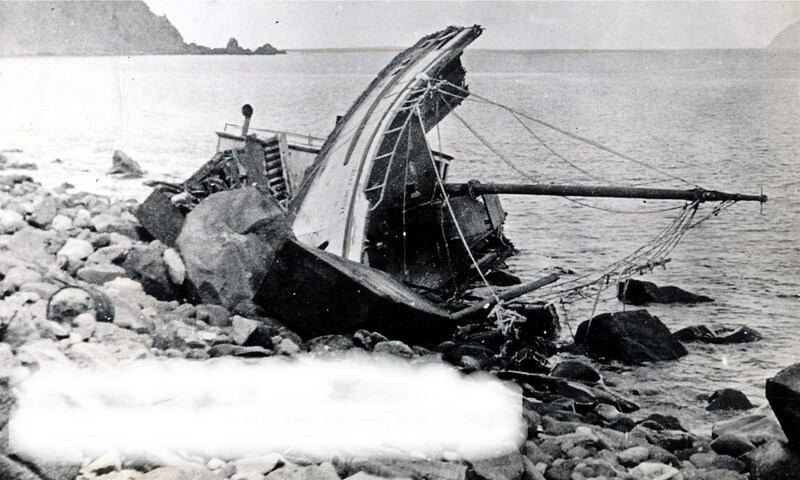 MARTHA WILKES (1910) The 67 ton 80 foot schooner Martha Wilkes stranded and was lost at Cape Bering, Siberia the evening of Saturday August 13, 1910. The vessel departed Anadyr, Siberia August 11th bound for Nome. There were three crewmen aboard and 1,000 lbs. of furs and skins valued at $600. The cause of the disaster is attributed to foggy weather, a strong SE wind and heavy seas. Natives rescued the crew of the Martha Wilkes on August 14, 1910. The vessel and her cargo were total losses with no insurance. The Martha W Wilkes was valued at $5,000 at the time of the tragedy. MARY BROWN (1893) The 43.6 ton 65 foot wooden schooner Mary Brown departed Sand Point October 3, 1893 bound for San Francisco and disappeared. She was carrying a cargo of miscellany and had a crew consisting of captain and owner Marzonia Brown, four seamen and two Eskimo crewmen (a man and a boy). There were eight passengers including captain Frank N Gafney of Lynde and Hough Company, James L. O’Brien and six of his men who had been engaged in conducting a store or station at Sand Point for the Lynde and Hough Company. They were all headed south for the winter. Many months after the Mary Brown went missing, Mrs. R. H. Hazelton, the sister of James O’Brien went north from San Francisco searching for tidings of her brother. With the help of Reverend Fred L. Stephenson, a missionary among the Alaskan Natives, the British authorities and two Native guides, Mrs. Hazelton was able to locate wreckage and the capsized hull of the Mary Brown near Banks Island, British Columbia. Captain O’Brien’s bloody clothing was found with the wreckage which indicated the possibility that foul play had been involved in the loss of the vessel. No bodies were ever found to help determine whether the vessel was lost to shipwreck, mutiny or attack by outsiders. MARY GRAY (1906) The schooner Mary Gray was lost in a storm in Dolphin Island Bay in 1906 along with the sloop Lila and schooner Olivia. The three vessels are mistakenly listed on Alaska shipwrecks lists since as early as 1914. All three were in fact lost off the coast of Alabama in the hurricane that made landfall south of Mobile September 27, 1906. MARY H THOMAS (1894) The 94 ton trading schooner Mary H Thomas was lost in the Bering Sea in 1894. She was valued at $8,500 at the time of the disaster. MARY SACHS (1917) The 30 ton 60 foot twin screw schooner Mary Sachs became frozen in the ice at Collinson Point near the Alaska Canada Border while owned by the Stefansson Arctic Expedition in late 1913. She never returned south but spent the next several winters hauled up on the beach and used as a camp shelter. She ended up wrecked and scavenged in 1917 on Banks Island near Cape Kellett. Remnants of the vessels engine and other large metal parts are still evident. Several local landmarks bear the name of the Mary Sachs including Mary Sachs Harbour and Mary Sachs Creek. MAXIE (1940) The 13 ton 35 foot wooden gas screw fishing vessel Maxie foundered August 12, 1940 on the west side of Bronson Bay. No one was aboard at the time of the casualty. MELDON (1967) The 42 ton 53 foot wooden oil screw fishing vessel Meldon stranded and was lost June 23, 1967 on the south shore of Long Island. The Mercury was listed with a value of “$16,000 & bal. of outfits”. Her cargo of oil and whalebone were listed with a value of $40,000. Both the Mercury and her cargo were total losses. MICHAEL J (1955) The 9 ton 28 foot gas water jet fishing vessel Michael J was destroyed by a storm August 6, 1955 off of the southwestern coast of Alaska. MIDAS (1898) The British bark Midas was lost with all hands in 1898 in the North Pacific. She departed Nagasaki, Japan some time near February 14, 1898 bound for the west coast of the United States and was never seen again. The bark Willscott and the Puritan were caught in a terrific storm following the same route from the Orient at the same time. The Willscott was dismasted and put into port in distress at San Francisco. The normal time at sea from the Orient to West coast ports was 24 to 36 days. The San Francisco Call reported her still missing on April 19, 1898, 65 days after the Midas left Nagasaki. MIDGET (1950) The 12 ton 33 foot wooden gas screw purse seiner Midget disappeared in the Gulf of Alaska May 10, 1950 on a trip from Cordova to Seattle with three persons aboard. A Japanese mine found washed ashore in the area lead to speculation that the vessel may have struck a mine and been lost. Lost with the Midget were owner John Erickson and brothers Ralph and Albert Peterson. MILDRED ROBINSON (1931) The gas boat Mildred Robinson was lost at Madeline Point in 1931. MISS POZZOLANA (1970) The oil screw Miss Pozzolana stranded and was lost August 18, 1970 at Dry Harbor. MOUNT WOLLASTON (1879) The 325 ton wooden bark Mount Wollaston was lost at Herald Island off the Siberian Coast October 10, 1879 with all hands. She hailed out of New Bedford, Massachusetts and was valued at $32,000 at the time of the disaster. This vessel had been caught in the ice and abandoned during the whaling season of 1876 but was salvaged in 1877 and put back into the whaling trade. Her cargo when lost was reported to be 300 barrels of whale oil and 4,500 lbs. of whale bone valued at $18,000.